Shri Raman Bhalla The Hon'ble Minister for Revenue,Reilef and Rehabilitation Govt of Jammu & Kashmir graced the occasion by being the chief guest , the function started with bouquet presentation to hon'ble minister Sh. 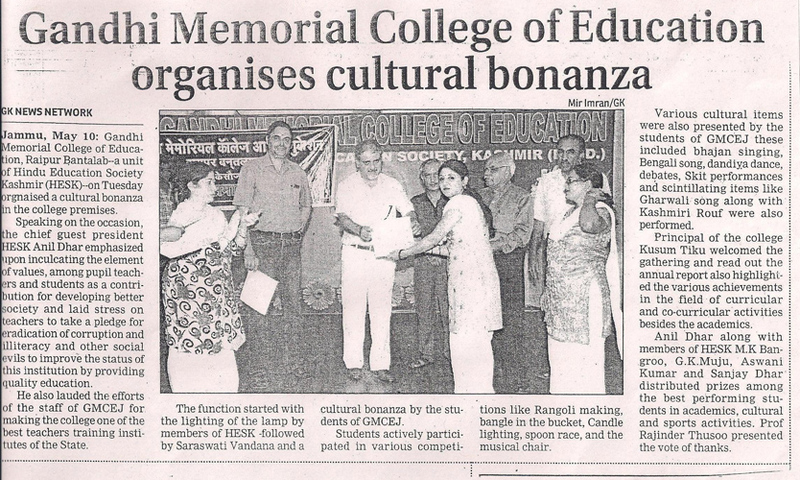 Raman Bhalla by Shri Anil Dhar President (HESK) followed by lighting of the Traditional Lamp by Sh Bhalla along with President(HESK)Sh Anil Dhar ,Gen Sec Sh A.K Raina (E.B)memberso HESK and the Principal GMCEJ. 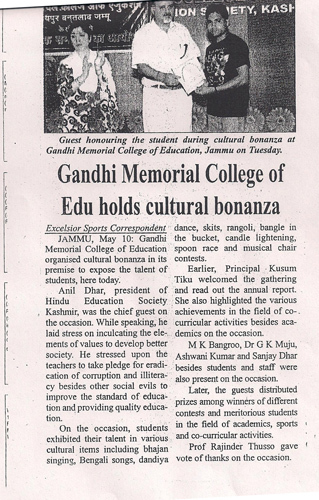 Dr Bindu Verma(principal GMCEJ) welcomed the hon'ble minister, esteemed president(HESK) and the august gathering followed by a scintillating cultural programme presented by the students of GMCEJ ,certificates were distributed by the chief guest among the students who excelled in various co curricular activities and brought laurels to the college. The chief guest congratulated the college Management and appreciated the staff as well as the students for organizing such an event. 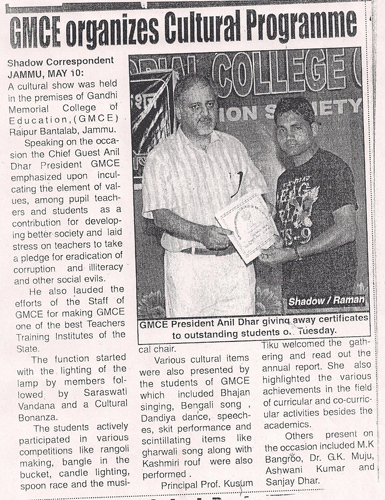 The President(HESK) Sh Anil Dhar presented a mementoe to the hon'ble minister Sh. Raman Bhalla. Sh Anil Dhar praised Shri Bhalla for all the Herculean tasks accomplished by him in all the fields.He also appreciated the students and the staff of GMCEJ for organizing such a colorful cultural programme . 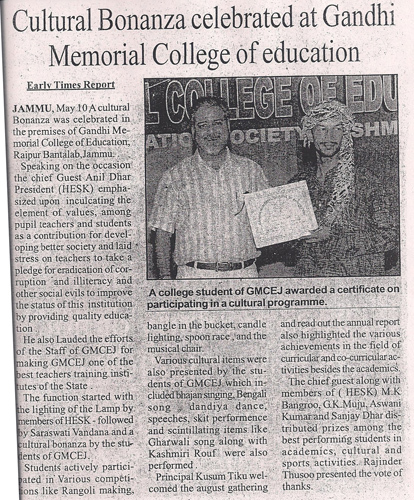 General Secretary(HESK)ShA.K Raina also spoke on this occasion and advised the teachers to be a role model of the society.